Most theme parks have rides, lands, and other features for very young visitors. Think Fantasyland at the Magic Kingdom and Disneyland. But a few parks are geared entirely for the 12-and-under set. Discover magical places where your young kids would be able to ride most of the rides. You know Legos. Most kids have a bucket of the snap-together blocks in their toy chests. Imagine a whole park constructed out of Legos and decked out in its primary colors. There are the requisite roller coasters (though they are tame), but many of the attractions are wildly inventive, hands-on, interactive, Lego-themed creations. This is the Florida version of the Lego-themed park. Like its California counterpart, it is geared for the 12-and-under set. It includes a Lego-themed water park. it also offers two onsite hotels. Legoland Florida has maintained some of the features from the site's previous incarnation as Cypress Gardens, including the lovely formal gardens and a ski show, which is now stars Lego pirates. Themed to the landmark PBS children's show, Sesame Place is designed for a pre-teen audience with a special emphasis on the program's preschool audience. Kids 12 and older probably wouldn’t be interested in New Hampshire's Story Land, but younger children would revel in its beguiling charm. And adults would adore the almost palpable nostalgia. Dating back to the mid-1950s, the front section of the park retains many of its original storybook tableaus such as the Old Woman in the Shoe, Humpty Dumpty, and the Three Little Pigs (with real pigs!). The back of the park offers some modern-day attractions including a wonderful raft ride, a steel roller coaster, and a log flume ride, but the thrills are toned down to pint-size levels. Ride review of Roar-O-Saurus, a wooden coaster at Story Land. Ah, the White Mountains. New Hampshire's majestic Presidential Range offers so many wonderful sights: Rugged mountain peaks poking through sun-streaked clouds, the spectacular National Forest along the Kancamagus Highway, the red and green Dodgem cars plowing into each other at Santa's Village. Too blase to marvel at the area's natural wonders, kids prefer man-made attractions like Santa's Village. For decades, the park has been a whimsical, yet vital part of the region's warm-weather vacation offerings. 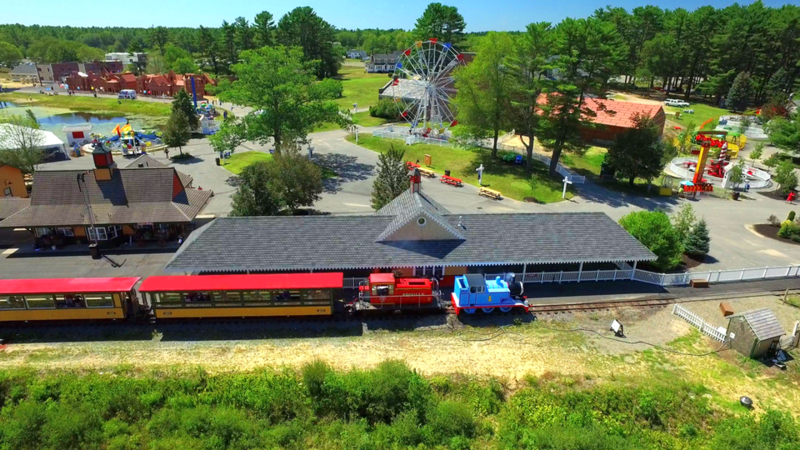 One of the country's premier parks for families with young children, Idlewild is loaded with charm along with the genuine nostalgia of an attraction that dates back to 1878. Olde Idlewild, one of seven areas at the park, features classic attractions such as a carousel from the 1920s, a 1947 Caterpillar--one of only two remaining that still use a canopy, and the circa-1938 Rollo Coaster, a wooden coaster. Boasting a signature castle at its entrance, Dutch Wonderland in Pennsylvania's Amish Country treats younger kids like royalty. Most of its rides are geared to the 12-and-under set, and even the youngest guests can enjoy most of the attractions when accompanied by an adult. In 2015, the small, train-themed park in Massachusetts opened Thomas Land as part of a big expansion. It features rides and attractions based on the popular PBS show,​ Thomas & Friends. The park also offers as dinosaur land, coasters, and other rides.